The sugary sand of a Punta Cana beach is so soft, so perfectly golden that you might think it was synthetic. And in fact, in this easternmost tip of the Dominican Republic, it’s possible. By definition, Punta Cana is a manufactured Caribbean getaway, completely catering to the needs of sun-seeking vacationers who like all-inclusive resorts but care little about venturing away from their hotel. But this area is not only popular for its abundant lodging and comprehensive amenities — Punta Cana beckons to jet-setters because it provides so many options (more than 24,000 hotel rooms) for such affordable rates. While this destination isn’t necessarily the most extreme, visitors can get their fill of thrills hiking to Hoyo Azul or taking on challenging golf courses like Punta Espada or La Cana. Overall, this reasonably priced Caribbean hideout is made for travelers of all ages seeking a relaxing turn from the norm. Punta Cana is part of the Punta Cana-Bávaro-Veron-Macao municipal district, in the municipality of Higüey, in La Altagracia Province. The area has beaches and balnearios which face both the Caribbean and Atlantic, and it has been a popular tourist destination since the 1970s. The Punta Cana area has an estimated population of 100,000, with a growth rate of six percent. To the north, it borders the village and beach of Cabeza de Toro, and then the Bávaro and El Cortecito beaches. The nearest city, the 500-year-old Higüey, is 45 kilometres (28 miles) away, and it takes about an hour to drive there. Europeans, particularly Spanish hotel chains, own all but two of the 50+ megaresorts of the Punta Cana tourism destination. The province’s 100-kilometre (62 miles) coastline tends to be mildly windy. The ocean waters are mainly shallows, with several natural marine pools in which visitors can bathe without any danger. From north to south, the main beaches are Uvero Alto, Macao, Arena Gorda, Bávaro, El Cortecito, Las Corales and Cabeza de Toro, all north of the cape; and Cabo Engaño, Punta Cana and Juanillo south of the cape. Bávaro is an area starting from Cabeza de Toro until Macao Beach. As the hotels started to rise along the East coast, Bavaro itself became a center of services with shopping malls, fast-food stores, drug stores, fine restaurants, banks, clinics, workshops, supermarkets, and schools. The major town in the district is Veron, now bigger than Higüey in territory, a spontaneous – and poor – urban development running along the original road from the west. Verón, last name of the French proprietor of a timberline business in the early 1930s, is now the base-city for hotel workers and related. It has, besides Bávaro, one of the only four gas stations in Punta Cana. The very next is located 48 kilometres (30 miles) west in Higüey, at the Fruisa crossroads, with a new Texaco gas station, 3 kilometres (1.9 miles) south of Macao beach, and the new Shell gas station close to the airport. Punta Cana features a tropical wet and dry climate. The weather is fairly consistent all year, with an average temperature of 30 °C (86 °F). The hot and humid season lasts from May to October, and during the day temperatures might reach 35 °C (95 °F). From November to March, temperatures during the evening are around 20 °C (68 °F). Very little rain falls around the area, primarily because of the mostly flat landscape, a combination of savanna and mountains. The area offers water attractions, such as racing speedboats, catamaran sailing, party boats, deep sea sport fishing, discovery cruises, floating spas, private yachts, swimming with dolphins, snorkeling cruises, swimming with sharks and stingrays, whale watching, reef exploring and visiting small islands like Catalina and Saona. The capital city Santo Domingo, and Los Haitises National Park, Samaná, are nearby. The Basilica Catholic Monument, built in 1962 and designed by two French architects, is in nearby Higüey, the 500-year-old capital of the Province. There are several resort developments: the Puntacana Resort and Club, Cap Canaone and the Majestic Elegance just to name a few. The Punta Cana International Airport is one of the busiest and best connected airports in the Caribbean. But this area is not only popular for its abundant lodging and comprehensive amenities, Punta Cana beckons to jet-setters because it provides so many options for such affordable rates. While this destination isn’t necessarily the most extreme, visitors can get their fill of thrills hiking to Hoyo Azul or taking on challenging golf courses like Punta Espada or La Cana. Overall, this reasonably priced, Caribbean hideout is made for travelers of all ages seeking a relaxing turn from the norm. Punta Cana is a manufactured Caribbean getaway, completely catering to the needs of sun-seeking vacationers who like all-inclusive resorts but care little about venturing away from their hotel.The beaches of Punta Cana are not very white; they are best described as a color of pure gold. For those tourists who do not work on your tan often can find perfect their golf shots in golf. Also try to take a dip in the Dolphin Island, wildlife Manatee Park or cool off in the clear blue water. Thrill yourself with a zip -line adventure, cultural show or explore the ecological park and the beautiful beaches. Exceeding customer expectations is how we define success. Ready to let you relax or step in with options like spa treatments, nine holes of golf, a lighted tennis court, and cooking workshops, we are here to make you happy. 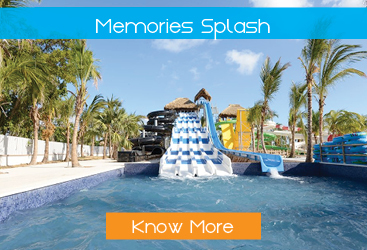 At Memories Splash Punta Cana – All Inclusive, spend the day on the beach where you can enjoy snorkeling. Then return for a meal at one of the resort’s 5 restaurants.